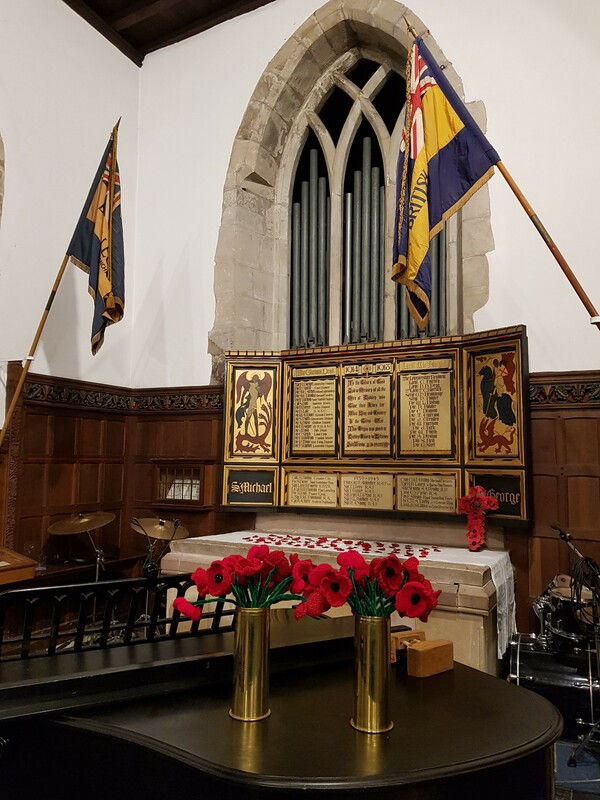 On Saturday 10th November, Grand Central Chorus and Finest Hour Quartet performed in a unique concert at Rothley Parish Church to mark the centenary of the First World War Armistice, and to specifically remember the 33 men from this one Leicestershire village who lost their lives during the Great War. It is Saturday 25 November 2017. I’m in a voice workshop organized by the Rothley Heritage Trust, of which I am Chairman. The Trust has Heritage Lottery Funding to tell the story of the Victorian Workhouse that stood in my village of Rothley. The project has researched the lives of a number of pauper inmates and prepared illustrations imagined for each person, as well as voice scripts that tell their story. Today’s workshop is to organize a group of volunteers to try out the scripts. Later each script will be recorded, and short video clips will be made mixing the images and the voices. The workshop organisers started with a warm-up exercise where participants would introduce themselves to their neighbour, discover something special about them, and then in the group session introduce this person and their special item. Volunteer Peter Tatham was introduced as having the special interest of singing barbershop style with the Grand Central Chorus. I’m a data-gathering sort of person, and this piece of information about a barbershop chorus of men, with a local contact living on my Village Green, was stored away in my priority ‘file’. Wearing another hat, I have a responsibility with a colleague of staging regular public engagement events at Rothley Parish Church, in a building that began life in Norman times. My colleague, using a recent study of Rothley’s war dead, was scheming a Casualty Walk around the homes of the 33 WW1 soldiers who died, for the morning of Saturday 10th November 2018. A fitting way of marking the centenary of the armistice of November 1918. Separately I have always treasured a dream of having a concert in Rothley Church that would feature 33 men standing alongside the church’s painted triptych listing of its 33 WW1 casualties. Was this the moment? Would this Grand Central Chorus in my priority file be the way to realise that dream, staging a concert on the evening of that Saturday, 100 years after the first armistice? The first meeting with Peter Tatham to float the dream was very positive. He caught the idea of such a Concert to mark the Centenary, and the need to be sure of getting 33 men to come. As we met again Peter continued to be positive, saying the Chorus was happy to fulfil such an engagement, and that ‘we have got 33 men signed up’. I introduced into the discussion some special items that would fit into the shape of the overall programme. We had a bugle player who would blow the Last Post & Reveille. We also had imagined a part where one of the 33 casualties would be impersonated by a young Rothley man in full Australian Infantry uniform. He would read a postcard that he sent from Gallipoli, and later read the Ode of Remembrance standing among the chorus of men. Peter added into the programme discussions the availability of the award-winning Finest Hour Quartet. With such an appropriate name as that, and their two signature songs “What More” and “So Long Mother” it was clear we had an emotional and musical scheme to make a splendid evening. Dealing with Peter and the eventual programme scheme we worked up was very special. What was so pleasing was that the scheme allowed some continuity slots where I could get across the significance of the 33 men alongside the 33 named casualties on the triptych. So on the night I was able to ask 33 men to come and take up positions on the risers and to help the audience to feel what it was like to see 33 living breathing men represent the fallen 33. The balance of the Chorus followed on. At the end of the first Chorus set, as the singers left the stage, I was able to tell the story of the Australian casualty Private Sidney Bull before introducing the Quartet for their first set. More from the Chorus, including the wonderful performance pieces from My Fair Lady and the appearance of Alfred Doolittle, and then the interval, where the Chorus were able to go back to their own green room in the nearby Church Rooms. The second part featured a song from the Chorus, then a joyful singalong for all of the Soldiers’ Songs, “Pack up Your Troubles”, “Tipperary” and “Good Byee”. Time for the tear-jerking “So Long Mother” and “What More Can a Soldier Give” from Finest Hour before the Last Post, and the Ode of Remembrance from Private Bull. The Chorus ended the concert with their beautifully positive “Silver Lining” / “Tomorrow” Medley. But the ending was carefully worked out with Peter and the Chorus. I was able to issue the military style command “Chorus Dismiss”. As the original 33 men left the stage, they each took a specially knitted poppy and placed it into two brass vases on a stand at the front of the stage. Private Bull added his own, and stood to salute the poppy display. The vases were fashioned from two shell cases retrieved from Etaples in 1919, one of German origin, the other British. Tellingly, all that was left on the stage was the 33 poppies in those vases. We trusted that between us we had duly honoured the memory of our 33 fallen. The beauty of Harmony had been wafted across the whole evening.